When the doors open for seating, theatre-goers are in for a visual extravaganza—the entire MAX (the larger of Signature’s two black box theatres) has been turned in a grand, paneled and marbled hotel lobby with swooping staircases flanking the massive front desk. This is one of the most magnificent sets Signature has ever designed and it suits this “Grand Hotel” to a T.
And in Signature’s inimitable style, the creative team does full justice to the musical. While the story may seem a bit dated and nostalgic, it does poke at the masks we all wear, with varying degrees of success, and asks what lines will be crossed—and more importantly, for whom. However, clocking in at less than two hours, and stopping the action frequently for a song-and-dance, the musical doesn’t really have time to answer any of these questions. This is a show to savor for the music and the dancing and lovely escapism. At its core, it seems to be best at portraying how people yearn—for better lives, for the younger us, for love. On the other hand, with the caliber of talent acting, singing and dancing on that stage, it can be easy to forget the questions raised until much later. And it’s all limned through a small cadre of characters who pass through and collide one weekend at this grandest of grand hotels in 1928 Berlin. We meet Colonel-Doctor Otternschlag (Lawrence Redmond), who opens the show shooting heroin into his arm; Elizaveta Grushinskaya (Natascia Diaz, in another role she was born to play), an aging ballerina who can no longer fill concert halls; her assistant Raffaela (Crystal Mosser, with some of the most expressive eyes seen on a stage); General Director Preysing (Kevin McAllister—and who knew he could play bad so well? ); Flaemmchen (Nicki Elledge) a possibly pregnant typewriter; Otto Kringelein (Bobby Smith), who’s dying and realizing he’s never lived; Baron Felix von Gaigern (Mkruman Gatling, a stunning voice), a penniless Baron trying desperately to hold onto his station in life; and the ensemble, who play everybody else (hotel workers, telephone operators, shareholders and scullery workers). Finally, we have Erik (Nicholas McDonough), an assistant concierge whose wife is in the hospital having a baby; Rohna (Ben Gunderson), the smarmy, nasty hotel manager; Witt and Sandor (Vincent Kempski and Gregory Maheu; the latter also plays the chauffeur/mobster) as Madame Grushinskaya’s drivers/helpers. Two who merit special mention are Ian Anthony Coleman and Solomon Parker III, as Jimmy 1 and Jimmy 2, who brings the house down with their dancing every time they have a number. And deservedly so. While much of the story (it is from 1928) is melodramatic and relies on coincidence, some performances stand out. Diaz’s Madame Grushinskaya is fragile, wry, and learning perhaps too late that she’s not the center of the universe. As a portrait of an aging artist, it’s a definitive piece of work. As mentioned above, who knew Kevin McAllister could portray falling off the straight and narrow so deliciously? He also doesn’t fall headlong into the wages of sin—you can see his initial delight at carrying off a huge bluff/lie, but you can also see him testing other limits, and consciously making a decision. Bobby Smith as Herr Kringelein is heartbreaking. He is old, dying, a little bitter, but determined to have a final weekend of luxury to learn how to live. Of all the characters, his is the easiest to root for—he never loses his basic humanity and regard for others. And Smith does this without resorting to sentiment; his character can be petty and a little self-pitying at times, but when he rallies to the big moment, he does so with all of his being. Plus, it’s always a joy to see Smith in a role, which while not as complex as some (but then, it’s not a complex book), still demands a growth arc, which he makes look easy and natural. “Grand Hotel” is directed by Eric Schaeffer; he makes full use of the MAX, immersing the audience in the experience. The jaw-dropping set was designed by Paul Tate Depoo III; and the costumes, which bring the period to life beautifully, by Robert Perdziola. One caveat on the night I attended—at times it seemed as if the orchestra (Jon Kalbfleisch as musical director) overpowered the actors; sometimes it was difficult to understand clearly the words. “Grand Hotel” is a visual and aural pleasure—sumptuously staged and beautifully acted, sung and danced. Even the old-fashioned telephone mouthpieces, which dropped from the ceiling at the appropriate moments, seemed to dance at the end of their cables. One thing it evokes: human nature hasn’t changed much—we all yearn for something. Advisory: Cigarette smoking, one gunshot, theatrical haze. Running Time: One hour and 50 minutes without an intermission. 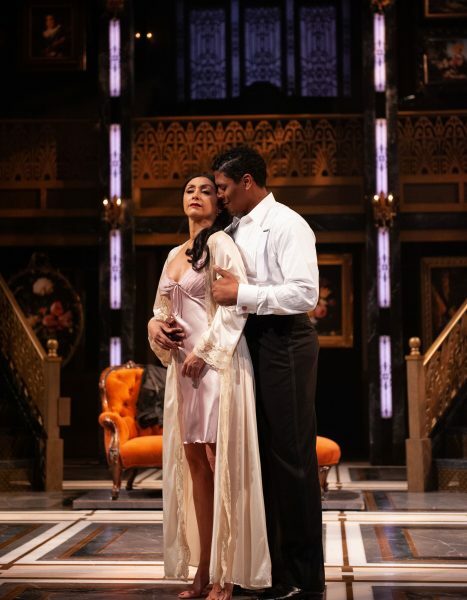 “Grand Hotel the Musical” runs from April 2 – May 19, 2019, at Signature Theatre, Arlington, VA. For more information, please click here.